Next up in the trade deadline series is left-handed relief pitcher Adam Conley. Like Drew Steckenrider and Kyle Barraclough, Conley also pitches for the Miami Marlins. 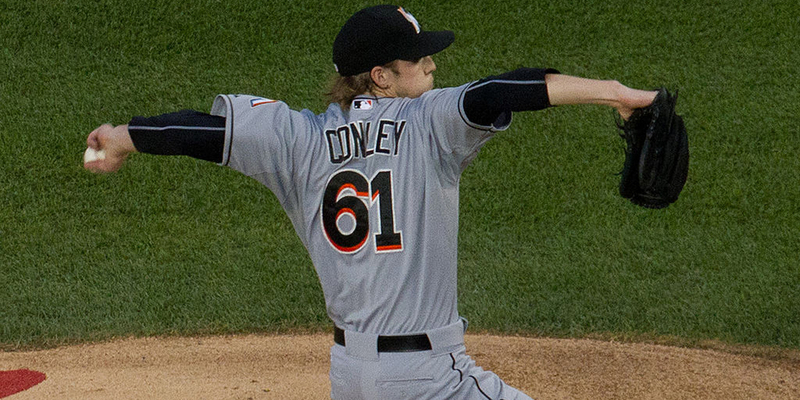 Unlike those two, Conley just might be the best reliever available on the Marlins. Conley has had an up and down career up until this point. He was drafted in the second round in the 2011 draft by the Marlins and has been a starting pitcher in their system ever since. In 2015, he posted a 2.52 ERA in Triple-A resulting in getting called up for the remainder of the MLB season — pitching to a 3.76 ERA over 67 innings. In 2016, he pitched similarly with a 3.85 ERA over 133.1 innings good for 1.5 fWAR, however he’s struggled to find that form since. He bounced around in Triple-A and the MLB last year, struggling at both levels putting up a 5.49 ERA in Triple-A, and 6.14 ERA in the MLB. 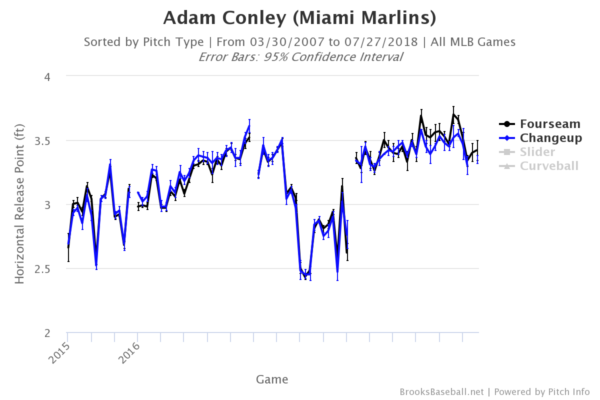 The Marlins started Conley in Triple-A this year as a SP, but in an effort to get him back into the MLB, they shifted him into the pen where he’s seen much more consistent success. Here’s how he stacks up this year next to the top reliever on the Dodgers, Kenley Jansen. Unfortunately, Conley gave up three runs while recording just one out in his appearance on July 26 against the Nationals. It was ugly in the box score, but in reality it shouldn’t have been as bad as it was. Conley walked Wilmer Difo to start the inning, which admittedly should have been avoided. He then allowed a fly-ball single to center against Michael Taylor which had a 30% hit probability. Adam Eaton flew out to center, and then Trea Turner hit a 330 foot fly-ball to right field with an 11% hit probability which dropped and was scored as a triple. With a runner on third with one out, Miami brought the infielders in against Bryce Harper who hit a chopping ground-ball down the first base line that bounced three times before it left the infield which would’ve been fielded easily had the infield not been in. A good defense behind Conley would’ve turned three earned runs into a lead-off walk followed up by three consecutive outs. Maybe it happened because I was writing about him. Who knows? That luck was evident in his peripherals as his ERA increased from 2.63 to 3.58, while his FIP only increased from 3.45 to 3.56. 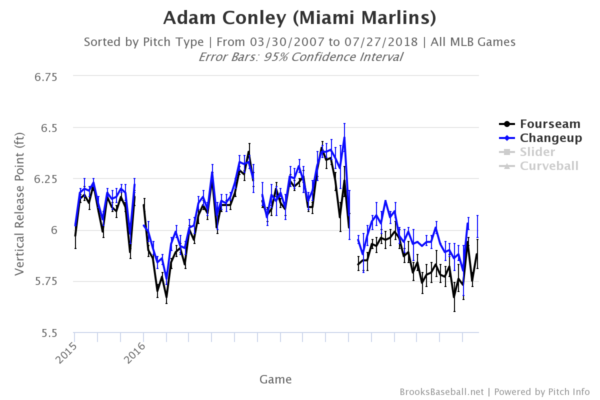 Although not yet at an elite level reliever this year, with Manny Machado already acquired, it would be very Dodgers-esque to follow up with a guy like Conley. He has a similar FIP to Jansen (3.22), Brad Hand (3.29) and Scott Alexander (3.36). He’s holding opposing hitters to a .182 batting average even after allowing three consecutive unlucky hits. His SIERA barely trails that of Alexander (3.16) and Archie Bradley (3.19), and is better than newly acquired Oakland Athletic Jeurys Familia (3.31), and Reds closer Raisel Iglesias (3.41). His whiff rate on the changeup has skyrocketed, going from an already strong 18.6% last year up to 31.7% this year (1st). With a strikeout rate of 28.8%, he’s right behind Keone Kela (29.5%), newly acquired Brewer Joakim Soria (29.3%), new Rockie Seunghwan Oh (29.1%), and is ahead of Jansen (27.9%) and Barraclough (27.6%). It’s not often someone gains a whole 5 MPH by shifting to the pen. However, it looks like it might’ve been something mechanics based as well. Over the years, he’s struggled wildly with inconsistency and whether it’s by luck, a new thought process, whatever it may be, his release points have tightened up both vertically and horizontally. There are a handful of reasons why starters turned reliever often times find improved success. 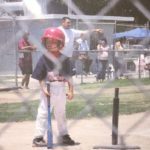 We’ve seen it happen before, first and foremost, velocity usually jumps up as they no longer need to keep energy in the tank for 90-110 pitches — they can go max effort for 15-30 pitches. 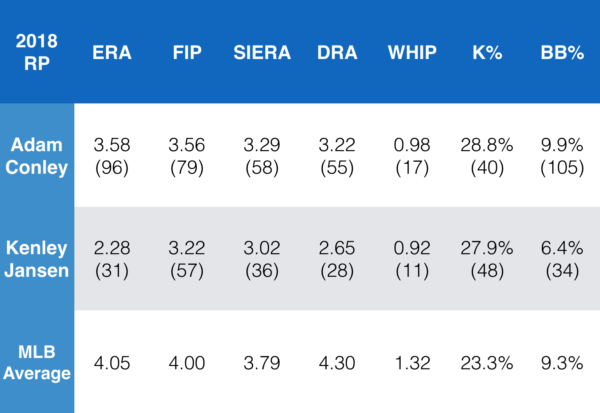 Another is that almost all decent starters have at least three serviceable pitches to combat the advantage that hitters have seeing the same pitcher multiple times whereas in the bullpen they only need one or two. In fact, a handful of star relievers currently pitching followed that path. In fact, he seriously looks like a similar type of pitcher to Tony Cingrani. 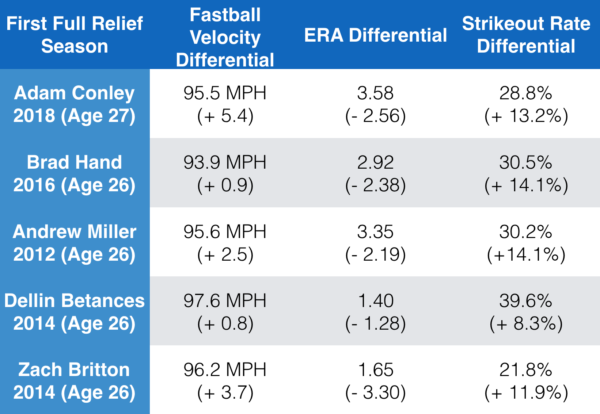 Cingrani throughout his career has experienced somewhere between 9.7 and 7.3 inches of vertical movement on his 4-seam fastball. As he’s progressively lowered his release point, he’s also experienced less “rise” on his fastball. Conley on the other hand currently has moved his release point down, and he’s also seen less “rise”, sitting at 7.3 inches of vertical movement this year, while Cingrani is a 7.4 inches of vertical movement on the fastball this year. It looks as if they’re morphing into the same sort of fastball. Conley this year (95.5), throws harder than Cingrani does (94.5) with a similar amount of “rise” and yet doesn’t target it or weaponize it like Cingrani and the Dodgers do. Cingrani throws his fastball in the upper third of the zone 15.3% of the time, good for fifteenth most frequent in the entire league, compared to Conley who attacks hitters up high only 8.1% of the time (164). Over the course of his career up until he was traded to the Dodgers, Cingrani had a 10.8% whiff rate on his 4-seamer. Ever since joining the team, he’s averaged a 13.7% whiff rate on that same fastball. It looks like there is more to be tapped into here, making his changeup and his 4-seamer really strong. If the Dodgers already have Tony Cingrani, why would they want to spend prospect capital to go after the next Tony Cingrani? Cingrani is a really really good reliever when healthy and would likely be our best bullpen option this year if he wasn’t hurt. It adds a safety net this year if Cingrani isn’t able to return, also what’s better than one great cost controlled reliever? That’s right, two great cost controlled relievers. Also, come playoffs Alexander has been really effective against left-handed batters and by having three great left-handed relievers it allows any of them to be the “setup man” based on the needs of the game. Absolutely need a ground-ball in the seventh inning? Nobody better than Alexander and with Conley/Cingrani there is no worry about using your setup man too early. Facing Anthony Rizzo, Kyle Schwarber, Harper or Freddie Freeman with runners on and a one run lead in the seventh inning? The flexibility allows the use of one of the three lefties as a LOOGY without the fear of having a lousy reliever pitching the eighth inning. Conley would be an expensive acquisition with the amount of control he has, but he seems like a very Dodgers type of guy. It’s not the first time we’ve heard of the shift to the bullpen working well for a struggling young starter. It’s totally feasible that he’s just hitting his stride now. And the interest in Conley isn’t coming out of nowhere. In either package, both Alvarez and Toles makes sense for the Marlins. They’ve long since liked Alvarez and Toles would slot in as either the starting left- or center fielder in Miami. With Matt Kemp, Joc Pederson, Yasiel Puig and Alex Verdugo ahead of Toles on the depth chart (not even counting guys like Cody Bellinger and Enrique Hernandez), moving Toles makes a lot of sense. He’d be an every day guy in Miami. Sborz is a reliever in Triple-A who could come up and help the Miami bullpen — especially if they deal Conley and/or Barraclough & Steckenrider. Vargas would be a nice low-level lottery ticket for the Marlins to try to develop. The reliever market is getting thin, and while Conley may not be the best fit overall, he might be the best option left outside of a surprise reliever becoming available.